No one wants to carry a phone, camera, mp3 player, and a BlackBerry. 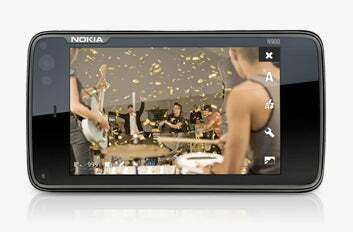 The new Nokia N900 is a 5 megapixel camera, a portable media player, and a Maemo mobile Internet device all in one. Full specs after the jump. The Nokia N900 lets you take and edit pictures with its built-in 5 megapixel Carl Zeiss Tessar lens autofocus camera with dual LED flash (4:3 and 16:9 ratio). View and edit images with an in-device photo editor, then tag and share. Take video using the VGA web cam or the main camera with wide-screen capability (up to 800x480 pixels). Then view your photos and videos on the 3.5" 800 x 480 touch display, or connect the N900 to your television and voila! — you have yourself a viewing party. And the Nokia N900 has up to 32 GB of internal storage, a touch screen and side-slide full keyboard for email and full Maemo web browsing powered by Mozilla technology. Connect to anything using Bluetooth or a micro-USB connector supporting charging and High-Speed USB 2.0. The media player supports MP3, .wma, .aac, .m4a, and .wav files. You can even listen to the radio through the FM transmitter or connect to the UPnP audio stream. How's that for convenience and capability? Click here for more info on the Nokia N900.